The Harry Winston Opus series gave a few talented independent watchmakers a showcase for making their wildest fantasies come true, including Emmanuel Bouchet, who first came to the horological public’s attention as the creator of the incredibly animated Opus 12. See The Harry Winston Opus Series: A Complete Overview From Opus 1 Through Opus 13 for more on it. 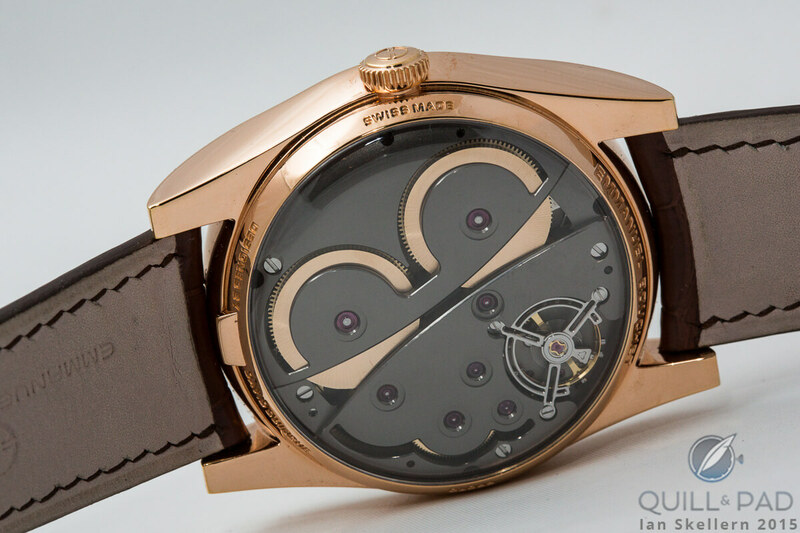 Bouchet has now founded his own eponymous boutique brand and his first offering is Complication One. In an apparent paradox for a watch christened “Complication,” it “only” indicates hours minutes and seconds. However, the time is derived and displayed in such an ingenious way that the name Complication One is fully justified. · Two Swiss lever escapements each with their own escape wheels, one on the back for the seconds and one dial-side for hours and minutes. · Two spring barrels, each driving independent gear trains (one for seconds, one for hours and minutes). · Two hands to display the jumping minutes (one for tens-of-minutes, the other for single minutes). · Day/night indicator on seconds subdial. The Swiss lever escapement is at the very heart of the vast majority of mechanical watch movements; Bouchet wanted to pay homage to this vital mechanism responsible for timekeeping precision with Complication One. But the problem with Swiss lever escapements is that they are relatively small, and the balance wheel oscillates relatively quickly: most beat between 2.5 and 3 Hz, which is 2.5 to 3 times per second both forward and back. This means that it is extremely difficult to understand and appreciate just what the escapement is doing. So Bouchet has developed a large, slow escapement that beats once every 15 seconds rather than multiple times per second. For emphasis, he has placed it dial-side for all to clearly see. Without knowing anything about it, if you had a chance to hold Complication One in your hand and give it even a cursory look, you would immediately know that this is an extremely high-quality wristwatch. That comes not just from the high quality of the materials and execution, but the shape, which − like time and space − is full of curves. On the dial side, what first strikes the eye isn’t so much the indications and that enormous wheel and mechanism (it’s an escapement), but just how everything on the dial appears to be floating so high. This is thanks to the box sapphire crystal that curves sharply down to the case rather than being a nearly flat crystal fixed to a bezel. Light coming in from the sides illuminates the transparent sapphire crystal subdials suspended above the dial, and the case appears slimmer because the case band is thinner than it would be with a standard crystal. Turn the watch over and, impressively, you see that the crystal for the display back is also strongly curved. Furthermore, incredibly, the rear movement plate is also curved and follows the shape of the rear crystal. Curved dials are rare enough, but curved movement plates are rarer still. And while we are looking at the back, it’s worth noticing the (Swiss lever) escapement, which appears, and is, quite normal as well as the two large spring barrels that take up nearly 50 percent of the space on the back. The reason that the two barrels can occupy so much terrain is because the movement does not require the standard gear train as found in the vast majority of mechanical watches. The two main components in any watch movement are the mainspring, which provides power, and the escapement, which regulates the power. If it wasn’t for the (not inconsiderable) detail of requiring hands or some type of time display, the escape wheel could directly mesh with the mainspring barrel and most of the gearing dispensed with. But we do generally need something to indicate hours, minutes, and often seconds. And each indication needs its own gearing so that it rotates at the correct speed. 1. Transmit power to the escapement, which portions the speed at which the power is unleashed (or how fast the mainspring barrel unwinds). The consistency of this speed, which comes from the balance wheel, determines accuracy. 2. Provide suitable gearing to drive the hours, minutes, and seconds displays at their respective speeds. In Complication One, the traditional Swiss lever escapement on the back regulates timing precision. Its gear train, powered by a dedicated mainspring barrel, only drives the seconds. This means that it is a relatively simple gear train, requiring fewer gears and wheels than a traditional gear train that also has to drive the hour and minute hands. So the seconds are fairly conventional, if anything at all about Complication 1 can be termed conventional. The second barrel powers the hour and minute displays with its own escapement, which is the large mechanism taking up much of the lower center of the dial. That big wheel between the hour (left) and minute subdials is actually an escape wheel. A deconstructed escape wheel to be precise. Before looking closer at this secondary dial-side escapement, it’s worth recapping the role of a normal escapement, which is to release power from the mainspring barrel at regular intervals. The intervals at which the power is released are determined by the oscillating balance wheel. The dial-side escapement on Complication One works in exactly the same way except that instead of the intervals that the escapement releases power being determined by a balance wheel, they are determined by a rotating sapphire Reuleaux triangle driven from the seconds gearing. What makes a Reuleaux triangle so special is that all points on a side are equidistant from points directly opposite, just like a circle. This means that the hour/minute escapement receives constant force. Clever. 1. There are two escape wheels, not one. And the lever − because for all its apparent “strangeness” this is still a Swiss lever escapement − passes between the two wheels. This is the first time that this has been done in a wristwatch (or anywhere else that I have been able to discover). 2. The teeth on the split, two-part escape wheel are internal rather than external. And as it is the seconds that regulate the timing of the secondary escapement via the Reuleaux triangle, the seconds will always be perfectly synchronized with the hours and minutes. No other escapement is able to do this. It’s also worth taking a closer look at the minutes display, which has two hands: one for single minutes (0-9) and one for tens of minutes. The single minutes hand jumps exactly when the second hand reaches 0 at the top of every minute. When the single minutes hand reaches 10, the tens-of-minutes hand advances one step. “Ahhh, but . . . .” I hear the murmurings of a few of the more forward-thinking among you, “There are only 6o minutes (6 x tens-of-minutes) in an hour. So what happens when we pass from 59 minutes to 60 minutes?” Well, as soon as the second hand hits zero, the retrograde tens-of-minutes hand flies back to zero. The advantage of the two-handed minutes is that even though the subdial is relatively small compared to central seconds, the individual minutes are very easy to read. Complication One only needs to display ten units/minutes in 360 degrees rather than 60. Now having written this, Complication One doesn’t appear to be as complicated as I initially thought. But if you are still having trouble understanding it all, then it’s my fault. However, join the club: it took me three interviews with Emmanuel Bouchet before I felt that I got it. And I still do not feel as though I understand it all, though if ever I do feel that I understand, the chances are that I don’t. Complication One is impeccably executed and the level of fit and finish is exemplary; however, it’s the massive, world-first, dial-side, deconstructed Swiss lever escapement that makes this timepiece so special. I’m very much looking forward to hearing more about Emmanuel Bouchet in the future. But for now, let’s enjoy this timepiece. * This article was first published on June 1, 2015 at Complication One By Emmanuel Bouchet Featuring A Giant Swiss Lever Escapement.